India’s central bank cut its policy repo rate for the second time this year to boost growth amid headwinds to its economy, especially on the “global front,” and again lowered its forecast for inflation and growth. The rate cut was largely expected by investors in light of slowing growth and below-target inflation, and India’s rupee only fell about 1 percent to 69.1 per U.S. dollar before bouncing back a bit. Today’s slight drop in the rupee comes after it has risen almost 8 percent since early October last year and compared with the start of 2019, the rupee is still up around 1.2 percent. RBI’s rate cut confirms the shift toward easier monetary policy worldwide since January, highlighted by the U.S. Federal Reserve and the European Central Bank’s decisions to push back planned rate rises for this year to 2020 while they take stock of the extent of the global slowdown. India’s economy began decelerating last year on slower public and private consumption, with total output slowing to growth of 6.6 percent in the fourth quarter of 2018 from 7 percent in the third quarter. Since its previous monetary policy meeting in February, when RBI also cut its rate 25 basis points, signs of weakening investment activity have emerged, RBI said, adding slowing global growth might impact its exports, which remained weak in January and February. 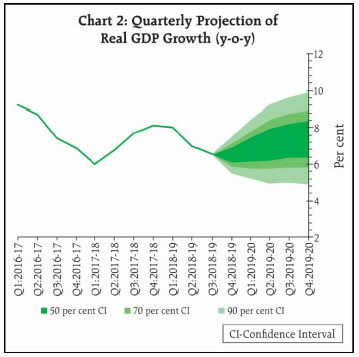 RBI lowered its outlook for economic growth in the current 2019/20 financial year, which began April 1, to 7.2 percent from February’s forecast of 7.4 percent. Risks remain balanced. 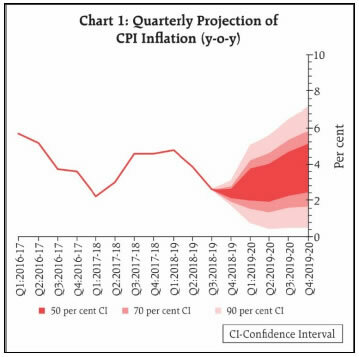 After 4 months of decline, India’s headline inflation rate rose to 2.6 percent in February but the central bank noted the increase was due to higher prices of goods that exclude food and fuel, such as personal care and recreation, and inflation expectations by households declined. Unlike February, when RBI’s monetary policy committee was unanimous in its decision, 4 of its members, including the governor, voted for today’s rate cut while 2 members to maintain the rate. 16. From a daily net average surplus of ₹27,928 crore (₹279 billion) during February 1-6, 2019, systemic liquidity moved into deficit during February 7 – March 31, reflecting the build-up of government cash balances. Currency in circulation expanded sharply in February-March. The liquidity needs of the system were met through injection of durable liquidity amounting to ₹37,500 crore (₹375 billion) in February and ₹25,000 crore (₹250 billion) in March through open market purchase operations (OMOs). Consequently, total durable liquidity injected by the Reserve Bank through OMOs aggregated ₹2,98,500 crore (₹2,985 billion) for 2018-19. Liquidity injected under the LAF, on an average daily net basis, was ₹95,003 crore (₹950 billion) during February (February 7-28, 2019) and ₹57,043 crore (₹570 billion) in March. The weighted average call rate (WACR) remained broadly aligned with the policy repo rate in February and March.